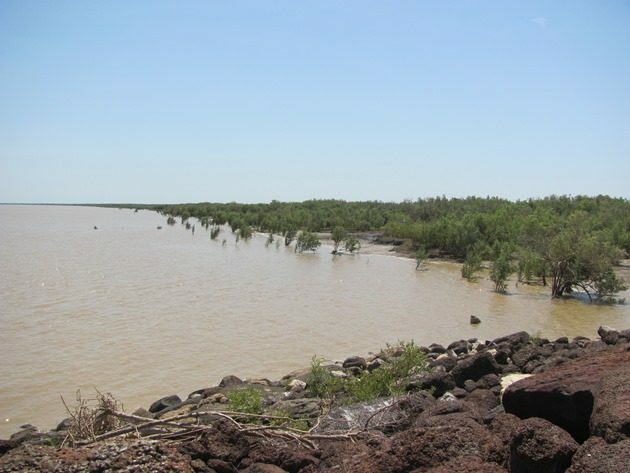 Over the years that we have lived in Broome we have often driven the road north to our closest town to go birding and although it is not that far away at just over 225kms/140 miles the birding can be quite different on the way and in Derby. It can be quite different whether you go birding in the dry months of the year or during our tropical summer, but there is always something to see! We always visit the Poo Ponds when we go to town and also check the airport for any bird activity. One other place that you really must go and spend some time as a birdwatcher is the Derby Wharf. It is a very reliable place for White-breasted Woodswallows that roost on the power lines and you can also sit in the shade near the mangrove trees and watch out for specialty birds like the White-breasted Whistler, Broad-billed Flycatcher and Yellow White-eyes. The tidal range in Derby is very big, so it pays to check the tide before heading off to the wharf to go birding, but I would say that you can see a lot of species at any stage of the tide. 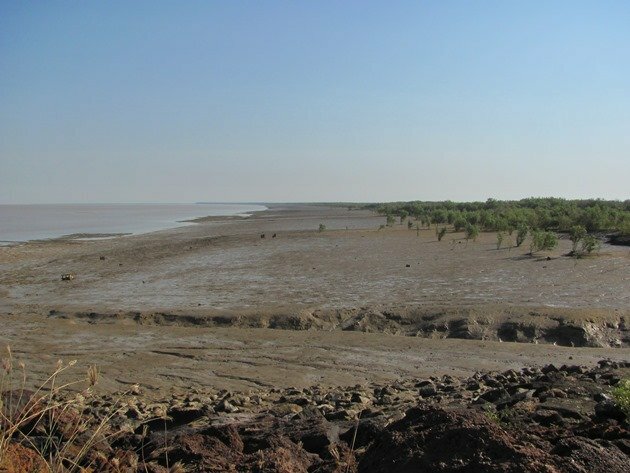 The header photo is of the tide partly in and the photo below is the tide partly out! If you are looking north as in the above photo we would recommend looking for the Great-billed Heron. 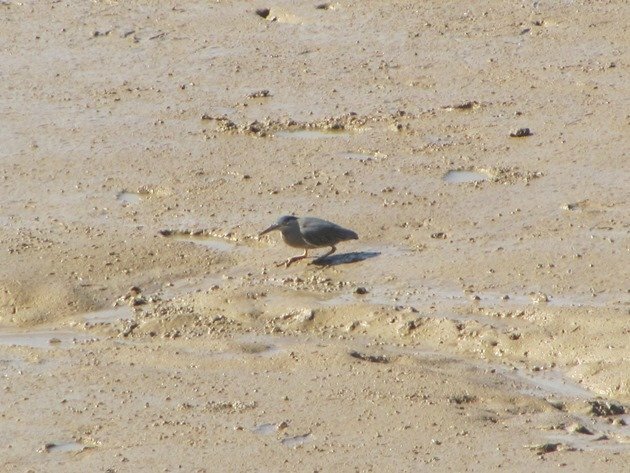 They can be seen with a telescope feeding when the tide is out if you are lucky! They are an unmistakable large grey bird and we have on one occasion made the effort to sit and wait for the tide and watch and eventually observe one! 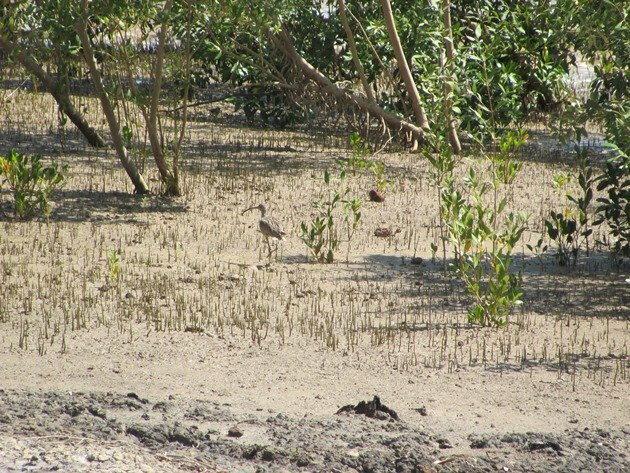 Meanwhile just below the wharf on the mud there are many other species to observe including the White-faced Herons and Striated Herons. 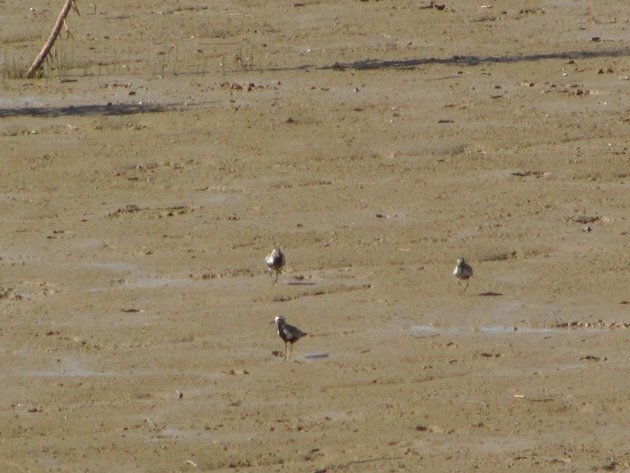 If you are visiting the Derby Wharf when the migratory shorebirds have returned to Australia then you will most likely observe Eastern Curlew, Whimbrel, Grey Plover, Greater Sand Plovers, and Common Sandpipers. 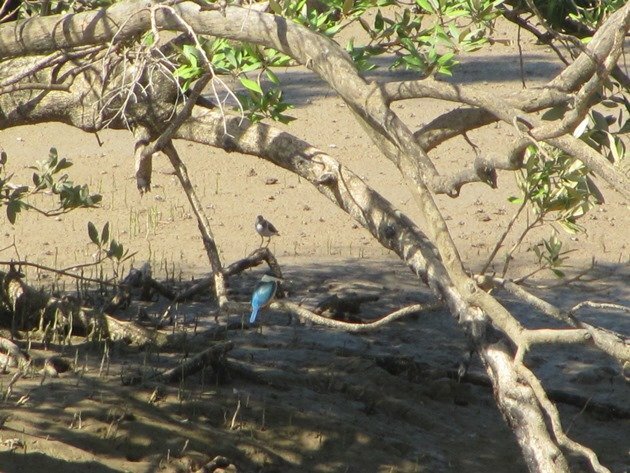 Sacred Kingfishers are usually seen at the Derby Wharf and are often perched on the debris in the mud or under overhanging mangrove trees. Often the first glimpse you get of them is a splash as they catch a small fish from the trickle of water that comes out of the mangroves as the tide goes out. There is a water tap for drinking and we always make a point of making sure there is a small amount available for the birds. 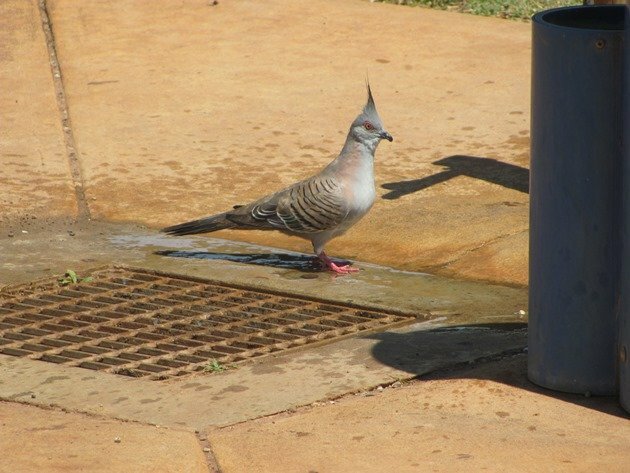 It is often visited by Zebra Finch, Peaceful Doves and Crested Pigeons. 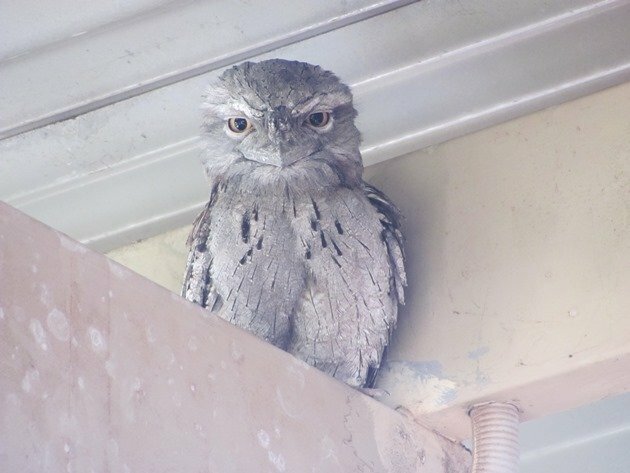 Close to the public toilets there is a cafe and it has been home to a pair of Tawny Frogmouths for some time, so it is worth checking under the veranda if you are in the area! 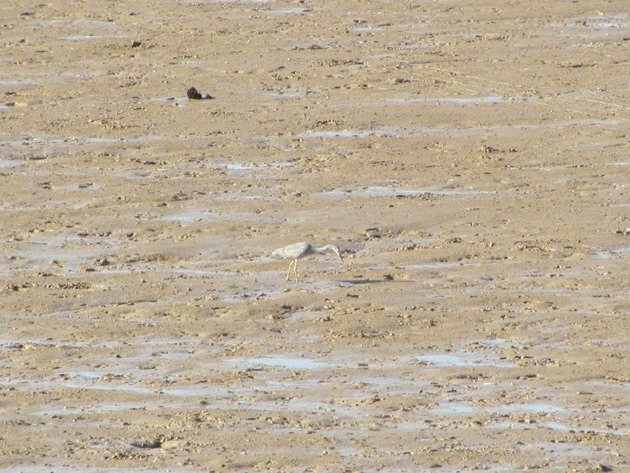 If you happen to be driving north from Broome it is worth your while dropping in at Derby to see the wide variety of birds there and who knows, you may get to see a Great-billed Heron at the wharf! It is a shame the Great-billed Herons don’t come as far down the coast as Broome! Thank you, Clare! 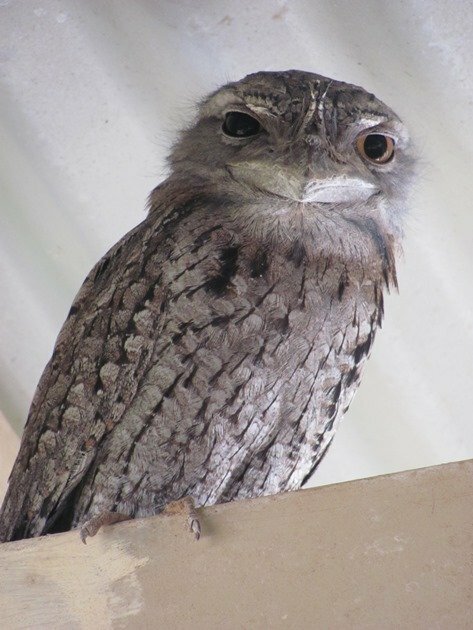 When I remember how hard we worked to see the Tawny Frogmouth in Queensland, I have to laugh at the one conveniently hanging out at the cafe in Derby! Doesn’t seem bothered by the human visitors? Great to learn about the birdlife in Derby! They don’t appear to be bothered at all despite being nocturnal birds! I just wish we had a way to work Broome into our agenda. You have come up with some amazing birds! Yes, it would have been great to show you around more of WA!